The Resort offers a quiet RV Park with some sites open year round! There are 4 sites with partial hookups of water and power and 15 full hookup sites, including cable TV. Our park is small and intimate. Noise and unruly behaviour is not tolerated. You can be sure to get a restful night's sleep. All guests are welcome to use the pool facilities with an additional charge of $2 per person for visitors to your site. The RV sites enjoy free hot showers and flush toilets. Campfire rings are on all sites and wood is sold. Pets are always welcome, but please consider leaving them at home during peak season. With a small campground the dog population can sometimes out number the guests. Our family resort is the perfect escape from city life - just 1.5 hours east of Vancouver at the base of Mt. Hope. 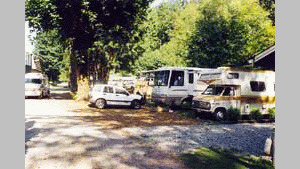 The Holiday Motel & RV Resort provides the international visitor with an affordable alternative to touring the lower mainland of British Columbia. Visit the city then come relax in the outdoor pool (warmed to 90°F). Kids can climb and swing on the playground. Cook outdoors on the BBQ patio! Hike the trails to our sasquatch caves and view the lithographs of native artwork. Any wilderness experience or outdoor recreational opportunity can be found in Hope. Do it all, then sit and enjoy yourself around the campfire - we provide the wood for motel guests! Please visit Holiday Motel & RV Resort - Camping Website.